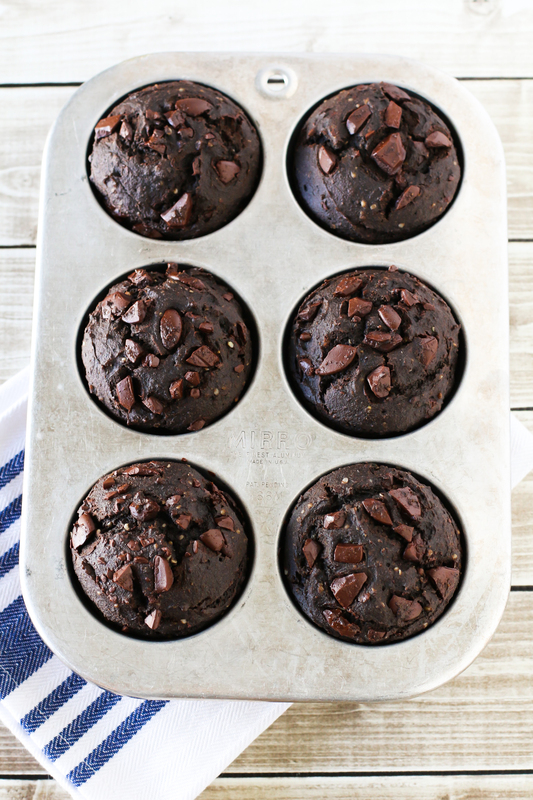 Chocolate doesn’t have to be a guilty pleasure, especially when it comes to these gluten free dark chocolate muffins. Refined sugar free, with extra protein and a secret ingredient too! I seem to be always craving chocolate. Now, that’s not a bad thing, is it? I don’t think so. Chocolate is packed with antioxidants and when it’s a high quality dark chocolate, even better. Chocolate can even be incorporated into to your morning breakfast! 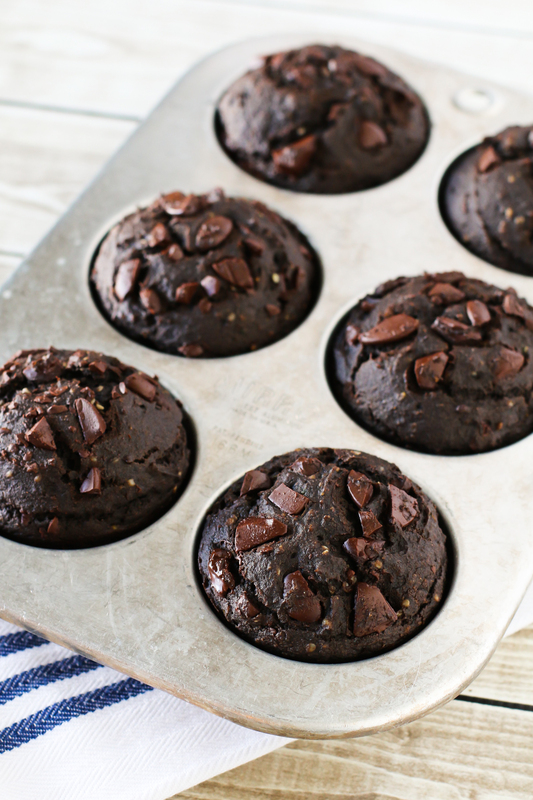 These dark chocolate muffins are filled with all good things. Protein from the hemp hearts and almond flour. Healthy fats from the coconut oil. No refined sugar, thanks to the coconut sugar and pure maple syrup. Vitamin C from the pumpkin puree. Yes, there is even veggies in these muffins! I couldn’t resist adding a little chopped dark chocolate to kick up the chocolate notch a bit. These healthy muffins are great for on-the-go and packing in school lunches. You can even trick yourself into thinking you are having dessert for breakfast. Preheat oven to 350 degrees. Line muffin tin with paper liners or spray with nonstick cooking spray. In large bowl, whisk together flour, cocoa powder, coconut sugar, almond flour, hemp hearts, baking powder, baking soda and salt. Set aside. Stir together almond milk, pumpkin puree, melted coconut oil, maple syrup, water, vanilla extract and apple cider vinegar in separate bowl. Pour liquid mixture over flour mixture and stir to combine. Fold in chopped chocolate, reserving 2 tablespoons. Scoop batter into prepared muffin tin. Top with remaining chopped chocolate. Bake muffins 18-20 minutes. Remove from muffin tin and place on cooling rack to cool completely. We love healthy treats! And we can’t wait to try these delicious looking muffins out, they look fantastic! Thanks for sharing such an awesome recipe. Love the recipes! I have family, who is strictly GF, however, I don’t have all the flours. 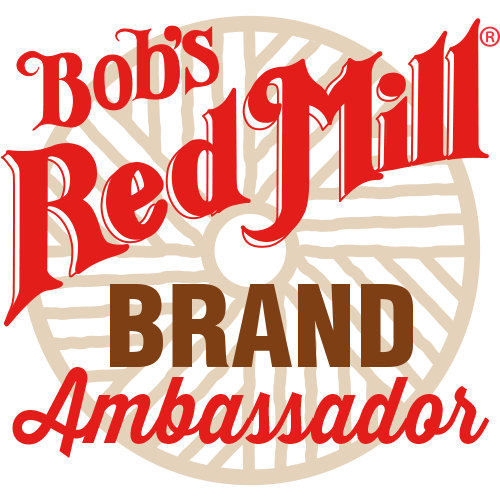 Will these recipes work with a 1:1 GF blend like Bob’s? Thanks so much, can’t wait to try em! Yep, a great flour blend to use! Great muffin! Not too sweet and a great chocolate flavor! I didn’t have coconut sugar or hemp hearts so I subbed just shy of a half cup dark brown sugar and just shy of a 1/4c of chia seeds. I made mini muffins and baked for 18 min.